I just wanted to take a moment to sing the praises of the lovely people at Marmalade Fabrics. I ordered some Kona Solids from Marmalade a few months ago when one of the new colors I was looking for was sold out at my usual suppliers. Of course, I couldn’t order just one color so I ordered a a handful of yards and half yards. My package arrived promptly and was beautifully packaged. I especially loved that each cut of fabric had a label with the color name. Tammy, the shop owner, also enclosed swatches of two new Kona colors that she thought I might like. Can it be that she is not only prompt and thoughtful but also psychic? Perhaps, because I really did love those colors. OK, so this level of service would be enough to make Marmalade a great choice for an online fabric provider, but here’s the best part: Marmalade offers loyalty points. 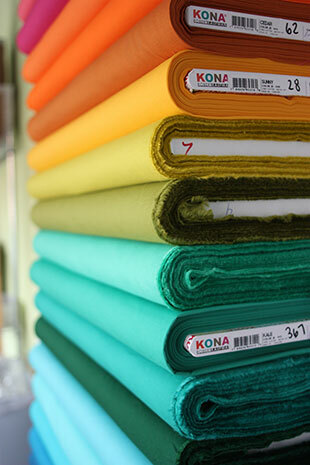 Last night I succumbed to temptation and ordered some Kona Solids in yellow (more on why yellow below). I was so pleased to be told that I had earned more than $14 in points that I could apply to my purchase. While I could admit that there is some sort of cycle going on here that involves fabric purchases leading to more fabric purchases, I think it’s safe to admit that I will be buying fabric no matter what and how great is it to be rewarded for it? So why yellow? I almost never use yellow. I see lovely examples of yellow in other quilters’ work (check out my Quilt board on Pinterest, and you’ll see lots of yellow) but I always seem to edit it out of my own designs. Not this time. I spied a piece of art tucked in the corner of a photo from the most recent DWR catalog that jumped out at me as a great quilt design. I plan to make a throw with a big center square in Kona Snow surrounded by thin squares in shades of bright yellow and maybe a little chartreuse. I am so looking forward to my package from Marmalade! This entry was posted in fabric, inspiration, quilts, suppliers and tagged design inspiration, fabric store, Kona solid, Marmalade fabric, modern quilt design on January 6, 2014 by brigitdermott.